We left Trier after a good morning taking photos around the town, and the elephants! 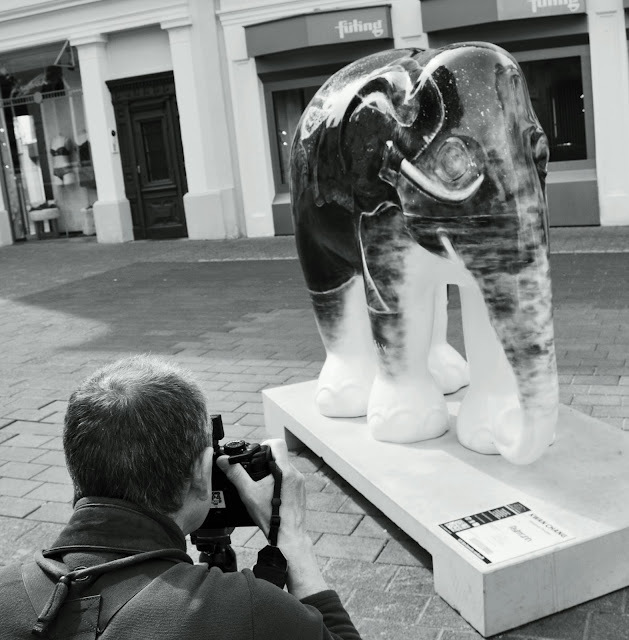 There was an exhibition of ceramic elephants across the town. Jan took a photo of me taking a photo of the only black and white one. Then it was on to Frankfurt to stay with my image licensing agent, Antje. We stayed with her and her family and had a very nice time. Before we left we had a meeting and talked over the new Berlin photos and a few issues. Then it was time to move on to Grindelwald in the Swiss Alps. Today we walked on the First side of the valley. Lots of avalanches in the heat, 26°C. I took photos of one on the Wetterhorn. No clouds so may be a day for panoramas! As usual I forgot to take photos for the blog so all except the avalanche photos were taken by Jan on her Nikon D90. The avalanche photos were taken on my Samsung Galaxy S3. All were edited using the Snapseed editor.